The golden spice of great antiquity. Legend has it that Venus fed it to her husband, Vulcan, to put him to sleep when her lover, Mars, came to visit. In Roman times, it scented the daily baths of the emperors and was strewn lavishly in the streets whenever they passed through. 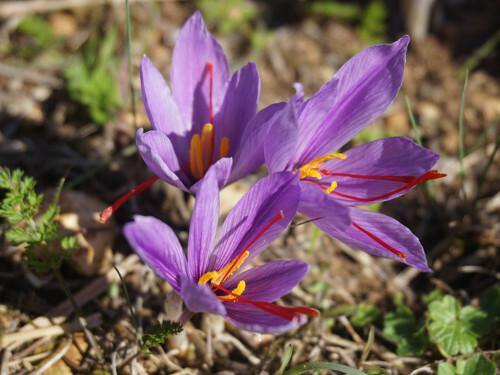 At about $4500 a kilo, saffron is the world’s costliest spice; it takes the stigmas of about 150,000 flowers to make one kilo. As costly as it is, it is nevertheless quite easy to grow in the garden; but north of zone 6 it needs to be wintered indoors in a cool place. About six plants are needed to produce enough spice for one recipe. It’s lovely lavender blossoms in fall are an added bonus. Due to plant import restrictions, this item can only be shipped within Canada and the U.S. NOTE: Order early to avoid disappointment.